Syrian government warplanes supported by Russia continued their relentless bombardment of the rebel-controlled eastern suburbs of Damascus for a sixth day Friday, killing nine people, opposition activists and a war monitor reported. The death toll from the past week climbed to more than 400. The new wave of bombings came a day after the Syrian army dropped leaflets over rebel-held eastern suburbs of the capital, Damascus, calling on residents to leave for their own safety and urging opposition fighters to hand themselves over. The leaflets were dropped by helicopters over the area known as eastern Ghouta, telling residents that they are surrounded from all sides by the Syrian army. The number of casualties has overwhelmed rescuers and doctors at hospitals, many of which have also been bombed. World leaders a day earlier called for an urgent cease-fire in Syria to allow relief agencies to deliver aid and evacuate the critically sick and wounded from besieged areas to receive medical care. But Russia’s U.N. ambassador Vassily Nebenzia, who called Thursday’s meeting, put forward last-minute amendments, saying the proposed resolution was “simply unrealistic.” A new vote was likely Friday. U.N. Special Envoy for Syria Staffan de Mistura called again in a statement for an urgent ceasefire to relieve the “appalling suffering” of civilians in eastern Ghouta by stopping the bombing there and the “indiscriminate” mortar shelling of Syria’s capital Damascus. A main Syrian opposition group called on the international community to prevent Russia from voting on a new U.N. Security Council resolution saying Moscow is part of the conflict in the Arab country. Russia has been a main backer for Syrian President Bashar Assad and has joined the battle on his side since 2015, tipping the balance of power in his favor. Opposition activists say Russian warplanes are taking part in bombarding eastern Ghouta. Salwa Aksoy, vice president of the Syrian National Coalition, told reporters in Turkey that according to the United Nations charter countries that are part of a conflict have no right to vote on draft resolutions. Aksoy said in Turkey Friday that “what is happening in Ghouta is a war of annihilation and crimes against humanity.” She blamed Assad’s government as well as his backers Russia and Iran for the violence. The United States accused Syrian President Bashar Assad of planning “to bomb or starve” opponents in besieged eastern Ghouta into submission — just as his forces did in Aleppo. The opposition’s Syrian Civil Defense rescue group reported Friday new airstrikes in Douma, Arbeen and other towns that make up the eastern suburbs of Damascus known as eastern Ghouta. The Syrian Observatory for Human Rights said at least nine people were killed in raids on Hammouriyeh, Zamalka, Douma and al-Marj. The Britain-based group monitors the Syria war through a network of activists on the ground. State news agency SANA reported that a projectile hit the capital’s Rukneddine neighborhood killing a man and wounding 15 others. It said the shell ignited a fire in the area and caused damage. Separately, Human Rights Watch on Friday criticized the way Turkey is conducting its offensive in northern Syria, saying it has failed to take necessary precautions to avoid civilian casualties. The New York-based group cites three attacks in the Afrin region in late January that it says killed a total of 26 civilians, including 17 children. In a statement, it called on Turkey to thoroughly investigate these strikes and make the findings public. Turkey launched an air and ground offensive in the Kurdish-controlled region on Jan. 20, saying it aims to clear Afrin of Syrian Kurdish militia known as the YPG which Turkey considers to be an offshoot of its own outlawed Kurdish rebels fighting within Turkey. According to several estimates around 120 civilians have been killed so far in the offensive. Turkey denies hitting civilians. 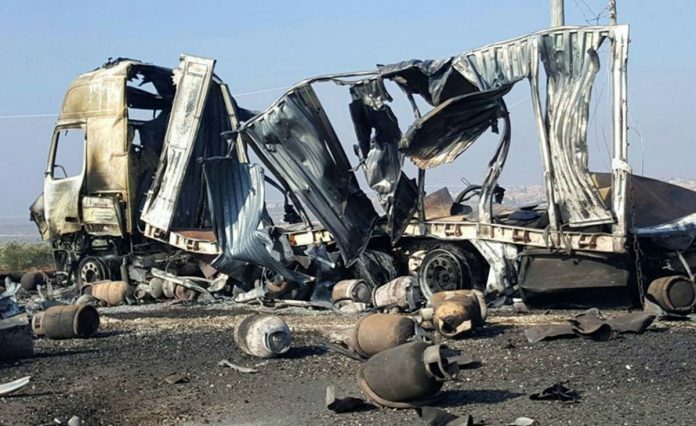 The YPG on Friday accused Turkey of bombing a convoy of civilians that was crossing into Afrin to protest Turkey’s offensive, resulting in multiple casualties who were moved to hospitals in Afrin for treatment. Syrian state TV had on Thursday night said a convoy carrying aid and heading toward Afrin has been targeted by Turkish artillery, inflicting casualties. The TV gave no further details about Thursday’s incident, which came two days after pro-government fighters began entering the predominantly Kurdish town to shore up the Kurdish forces, after reaching an agreement with the YPG. Turkey has threatened to bomb the forces if they work together with the Kurds. Turkey’s military said Friday it hit a convoy carrying weapons and ammunition in the countryside of a Kurdish-held enclave in northern Syria. The army said in a statement that Turkish artillery hit the 30 to 40-vehicle convoy of the YPG in southeastern Afrin. Aerial video accompanying the statement showed the alleged strike.